Hot dogs are magical treats. But sometimes they are scary and magical, all at the same time. And I'm not just talking about the ones that plump when you cook them. Fortunately, Niman Ranch was kind enough to produce a link made with uncured beef that hails from a farm where we know the animals are treated well. Nobody wants a hot dog made from cows run over by a forklift. Aptly named, these Fearless hot dogs can be eaten without fretting over whether or not the animals were cared for humanely, and that just makes them taste even better. 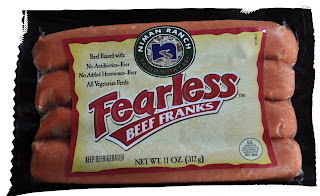 They’ve officially replaced my longtime favorite, Hebrew National, and because the Fearless franks are jumbo sized, I usually only eat one instead of two. The only downside is that they’re not as widely available as a lot of the larger brands--you can typically find them at grocers like Berkeley Bowl, Whole Foods, and Trader Joe’s. even better topped with homemade veggie chili! Where can you buy these hot dogs. Trader Joes stop selling them? I don't know where you are, but Berkeley Bowl here in the East Bay sells them. 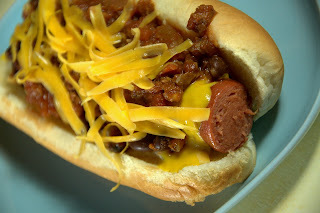 Many places that carry Niman Ranch meat also carry the dogs--hope that helps! I buy them at New Leaf. Glad I found them, after TJs stopped selling them.